BISMARCK, N.D. — A lottery game played in some northern states for nearly two decades is ending with Wednesday's final drawing due to sagging sales. Wild Card 2 has had dozens of jackpot winners, including a $2.8 million payout in Idaho in June 2007, and has paid out tens of millions of dollars in total winnings. However, ticket sales have been waning as new games have been introduced and Wild Card 2 has reached the end of its life cycle, according to lottery officials in North Dakota, South Dakota, Montana and Idaho. "The game has run its course," North Dakota Lottery spokesman Ryan Koppy said. "Games come and go. They all depend on sales." Year-to-date Wild Card 2 ticket sales in the four states are down about 6.5 percent from last year, according to the Multi-State Lottery Association, which oversees the game. "The decision to end the game was based on waning popularity overall in all states that offer (it), and wasn't based on the performance of a single state," South Dakota Lottery spokeswoman Kelly Thompson said. Wild Card 2 got its start in 1994 as the Tri-West Lotto in South Dakota, Montana and Idaho, with a starting jackpot of $150,000. It became the Wild Card game in 1998, with a jackpot starting at $200,000, and was offered in those states and Nebraska, according to the lottery association. Nebraska dropped the game at the end of 1998, a few months before it was changed to Wild Card 2 with a starting jackpot of $100,000. North Dakota joined the game in 2004. In 2013, the starting jackpot was increased to $200,000. "We're looking for different games we can offer in our product mix," Koppy said. "The (Wild Card 2) game has been around for quite a while." Through the years, the game has paid out $14.5 million in North Dakota, about $30 million in South Dakota, more than $14 million in Montana, where records go back to fiscal 2004, and more than $24 million in Idaho, where records don't go further than fiscal 2001. The jackpot for the final drawing was $375,000. "If there's no jackpot winner for Wednesday's draw, the remaining funds will be divided among the four states that offer the game," said South Dakota Lottery Executive Director Norm Lingle. If there is a winner, the person will have six months to claim the money, as usual. 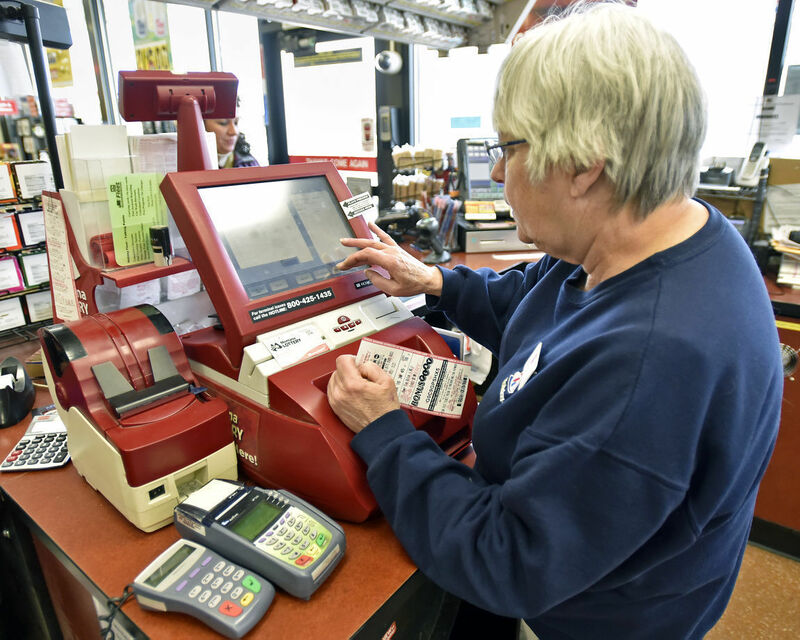 Sheila Sandberg prints out Powerball lottery tickets for a customer at the Holiday Stationstore at South Reserve Street and South Avenue in Missoula. In three days last week, the Montana Lottery took in $2.4 million in Powerball sales alone – almost 10 times what it normally does. Of course, never before had a jackpot reached $950 million. Now, since no one won it Saturday and the jackpot has jumped to an unprecedented $1.5 billion — with a chance it could go even higher — retailers are in the midst of another run on tickets from wannabe billionaires. With the even bigger jackpot and an extra day of sales now in the mix, in the first week and a half of 2016 the Montana Lottery could take in what it normally takes half a year to generate through Powerball sales. The changes, made in October, added 10 numbers (from 59 to 69) to the total from which five winning numbers are selected. Even though the number of Powerball possibilities was simultaneously reduced from 35 to 26, the odds of matching all five numbers plus the Power Ball skyrocketed. The change in the matrix added more than 100 million possible combinations of numbers that could win to a total that already stood at 175 million. That drove the odds of any one ticket matching the winning numbers to an astronomical 1 in 292,201,338. Someone has a far greater chance of being killed by parts falling off an airplane. When the Powerball game debuted in 1992, the odds of winning the jackpot were 1 in 54,979,154 — and still, your chances of being killed by falling airplane parts was greater. That doesn’t stop many people from trying their luck when jackpots climb to mind-boggling amounts. Berg says there is no way to track how many people in Montana are buying lottery tickets. But in the three days leading up to Saturday’s drawing, she said there were 551,661 separate transactions. Some of those were likely people who purchased multiple chances on the same slip of paper, Berg said. Others may have been a single individual buying separate tickets for themselves and others, with each recorded as a separate transaction. Still more may have bought Powerball tickets on more than one occasion. “That’s why I go with the dollar amount,” Berg says of the $2,416,338 worth of Powerball tickets sold on Jan. 7, 8 and 9. By comparison, Montana’s total Powerball ticket sales for the last fiscal year were $12.5 million. Montana’s total for the three days leading up to Saturday was but a drop in the national bucket. Forty-four states, the District of Columbia and two U.S. territories now sell Powerball lottery tickets, and Montana was responsible for about a quarter of 1 percent of the $929,998,415 in all sales from Jan. 7-9. Nationally, 25 tickets came within a number of the $900 million jackpot, and paid out $1 million each. No one in Montana came that close, but more than 44,000 tickets paid back between $4 and $300. The higher amount went to tickets that matched four of five numbers and missed the power ball, or three of five numbers and hit the power ball. For each $1 in Powerball sales, Montana spends 50 cents paying out prizes won, according to Berg. Sixty-eight percent of those 50 cents goes to the Multi-State Lottery Association to help pay for the big jackpots, no matter where the tickets are sold. The rest is used to pay smaller prizes won in Montana. Just more than 39 of the remaining 50 cents from each $1 in sales winds up in the Montana general fund. Intralot, the company that supplies and maintains the lottery machines located in 950 retail outlets across the state, gets just under 6 cents per $1. Retailers, meantime, get 5 cents for every dollar’s worth of lottery tickets they sell. Montana was the seventh of the now 44 states to sell lottery tickets for games sponsored by the Multi-State Lottery Association, joining in 1989 when the main game was called Lotto America. By 1991, the state had itself a record winner when Darlene and John Sharp of Havre bought a winning ticket for a $47 million jackpot that seems pretty paltry these days. In 1999, schoolteachers Dean and Kristi Drenzek of East Glacier won a $19.3 million Powerball jackpot — but didn’t claim it or tell anyone they’d won until school let out for the summer 2 1/2 months later, so as to not disrupt their classrooms. Montana had its last Powerball jackpot winners in 2010. Two home health care workers, Kim Claassen and Joseph Lamport Jr. of Helena, shared one of two winning tickets for a $97 million payout. The other ticket was purchased in Ohio. Claassen and Lamport split $48.5 million. Wednesday’s $1.5 billion jackpot is what you get if you match all five numbers plus the Power Ball, and opt to have it paid out to you over the next 29 years with an annuity. If you want cash up front, you’ll get approximately $930 million in one lump sum. That, mind you, is before federal and state taxes are taken out, which will probably leave you with roughly half of what you started with. So deduct more than $1 billion from that $1.5 billion jackpot for a more realistic estimate of what you’ll end up with if you beat the 1 in 292,201,338 odds and take the money up front. Also, remember you’ll split the winnings with anyone else who has the same numbers. The experts figure that so many possible combinations are being sold across America – only Utah, Nevada, Alabama, Mississippi, Alaska and Hawaii don't offer Powerball – that there’s an 80 percent chance someone in America will win it all Wednesday. But if no one does? “I can’t even begin to guess what we’d be looking at for a jackpot,” Berg says. * Note: Closed meetings are for those seeking help only. At open meetings, those seeking help may bring support people or the public may come for more information. At 7 p.m.: Atonement Lutheran Church, 1290 Sierra Granda Blvd. At 7 p.m.: End of the Road at 3123 Eighth Ave. S.
Latest ski conditions (new snow/average base/surface conditions) as reported at 3 p.m. by SnoCountry.com. Conditions subject to change. For updates and information on more Montana and Wyoming ski areas, go to billingsgazette.com/skireport. Montana Cash: 06, 07, 15, 19, 27. Wild Card: 04, 06, 08, 13, 28. Wild Card Queen Of Hearts. Hot Lotto: 05, 09, 20, 21, 24. Hot Ball 05. Hot Lotto Sizzler 03. Powerball: 09, 10, 32, 42, 55. Powerball 06. Power Play 02. Mega Millions: 18, 25, 47, 51, 61. Megaball 05. Megaplier 05. Lucky For Life: 01, 09, 20, 22, 33. Lucky Ball 03. Montana Cash: 06, 07, 11, 14, 43. Wild Card: 15, 16, 21, 24, 32. Wild Card Jack Of Clubs. Hot Lotto: 05, 15, 26, 35, 41. Hot Ball 04. Hot Lotto Sizzler 03. Powerball: 17, 40, 41, 46, 69. Powerball 06. Power Play 02. Mega Millions: 12, 14, 18, 24, 61. Megaball 10. Megaplier 03. Lucky For Life: 14, 25, 28, 37, 42. Lucky Ball 01.